People gather at the top of the hill at Gold Medal Park in Minneapolis to catch a glimpse of the bridge collapse. Spectators tried to get as close to the devastation as they could, even though they were prevented from seeing anything at all. The curious came anyway. "Even if I can't see it, I had to be here," one said. This was their ground zero, and they had to see the devastation up close, in person. You couldn't get close Thursday to viewing the devastation, the site where the Interstate 35W bridge over the Mississippi River came crashing down during Wednesday evening's rush hour. But thousands of spectators came to see for themselves anyway. "Being here brings it all home," said Lisa Rudquist, 33, of Savage. She said she drove over the bridge regularly on her way to work in Minneapolis. "I just want to see the magnitude of it," she said. But she couldn't. Police barricades kept viewers off the nearby Stone Arch Bridge and other possible viewing destinations. From the hill by the Guthrie, and the Guthrie itself, viewers could see the tip of the end of the bridge, but little more. Yet, the curious continued to come to the downtown river bank near Washington Avenue. 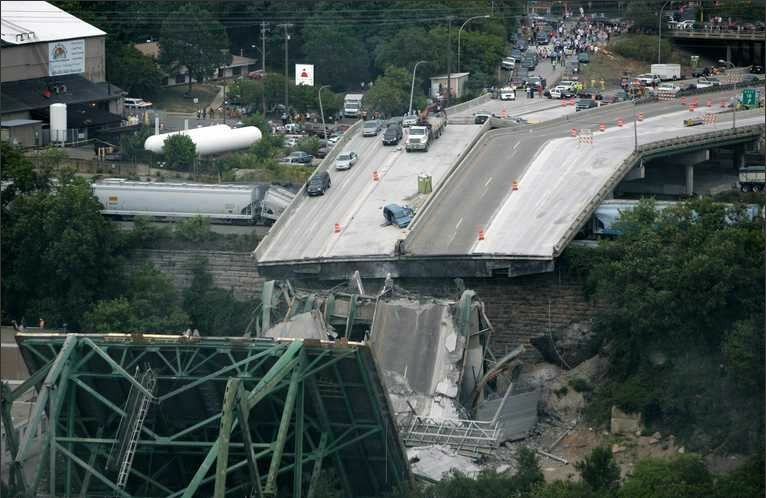 "I've lived in this city 33 years, went to school at the university and used to park under that bridge as a student," said Pete Engebretson, 45, of Minneapolis. "This is surreal. The only way to understand this is to see it for myself." Outside the Guthrie, Steve Brennan, 54, of Minneapolis, was saying that "it's something you don't see every day." Added Maggie Brennan, 24, his daughter: "It's something that happens in other states, not here." But why would they stay, if they couldn't see anything? "People don't want to ignore what happened," Maggie Brennan said. They wanted to see what the entire world is talking about, said Stephanie Muck, 18, of Eden Prairie. Her sister, Sonja Muck, 20, a student at University of Minnesota Duluth, was at the Twins game Wednesday night, but left in the eighth inning to view the wreckage. "It was too dark by then," she said. "And now we can't get close. But we're here, and that makes us a part of it. "I was supposed to drive to Shoreview before the Twins game and would have taken the bridge on the way over to the Metrodome," she said. "I can't say why I changed plans. Who knows why any of this happens?" Julia Van Hamm, 59, of Golden Valley, stood outside the Guthrie and talked about the stories she'd heard over the previous 18 hours, stories of near misses. Her co-worker, Patty Korlin Downs, 43, of Lake Elmo, always takes the 35W bridge home. Wednesday, though, she had to take her children to swimming lessons. Fearing she might be late because of road construction, she opted for Cedar Ave. instead. "I'm one of the lucky ones," Downs said. "It could easily have been me. I had to be here today. I had to see it for myself. "Even if I can't see it, I had to be here." Some said they wanted to tell future generations that they were at the scene. Others wanted to be part of the crowd. Jeff Margolis, 37, of Minneapolis, usually runs along the river a few days a week during his lunch hour. "There's 20 times the number of people that you usually see here," he said. "This is a little bit of overkill," Bill Seifert, 61, said as he stood by his bicycle and stared at yellow tape and police officers blocking various paths near Mill Ruins Park, along the river. "They won't even let you view from the Stone Arch bridge."